The vast screen real estate, which is provided in large-scale interaction environments presents novel ways to visualize and interact with data-rich models. In parallel to this technological revolution, interactive surfaces and devices have also become widespread in different sizes and devices ranging from large-scale walls, touch surfaces to wearable computing devices. Indeed, the ISS and HCI communities have witnessed, in recent years, an increased usage of interactive large-scale walls, touch displays, tabletops, mobiles (e.g. tablets and smart phones), and wearable devices (e.g. watches, glasses). The opportunities for innovation exist, but the ISS and HCI communities have not yet thoroughly addressed the problem of bringing effective collaboration activities using multiple interactive surfaces and devices, especially in complex work domains. Of particular interest is the potential synergy that one can obtain by effectively combining different-sized surfaces and devices. In this context, this workshop proposes to bring together researchers who are interested in improving collaborative experiences through the combination of multiple interaction surfaces with diverse sizes and formats, ranging from large-scale walls, to tabletops, mobiles, and wearables. This workshop aims to exchange experiences regarding collaborative user interface design techniques that were designed for, or adapted to people involved in all kinds of collaborative activities, either remote or co-located. 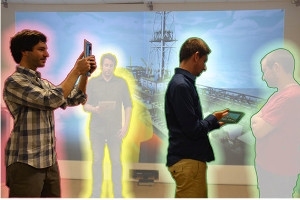 Since many of these techniques are highly focused on specific target groups, a further aim is to extract general principles and to generate guidelines for bringing effective collaboration around interactive surfaces.